JAMMU: Baba Ghulam Shah Badshah University (BGSBU) in Rajouri scaled yet another milestone by setting a new academic norm to favour blue-eyed scholars leaps and bounds, surpassing the prescribed limits. The list, carrying the names and marks obtained by four selected candidates as also four candidates placed in the waiting- list, is duly signed by five of the six member DRC/M.Phil Committee of the University. 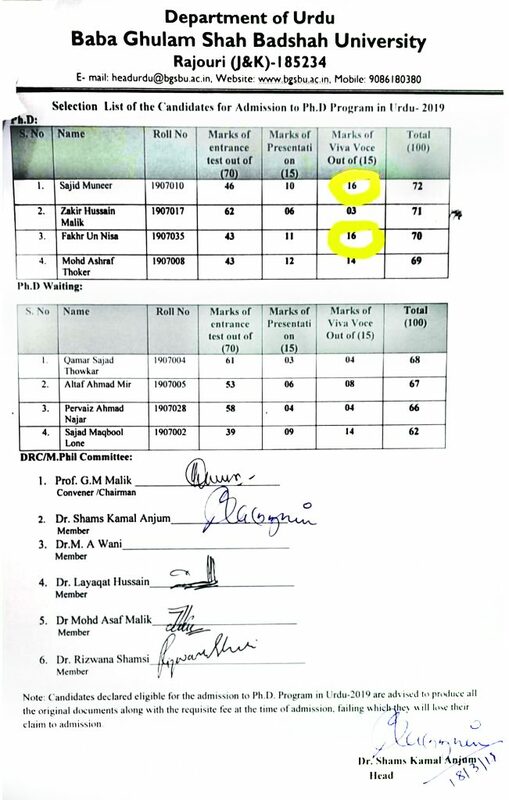 The panel allotted 16 marks out of 15 each to Sajad Muneer (roll number 1907010) and Fakhr Un Nisa (roll number 1907035). This is not for the first time the BGSBU is hogging the headlines for wrong reason. The university has attained notoriety over manipulated results and other activities over the years. Previous articleAt least 7 injured in Gaza rocket attack on Israel. Next articleWorld Tuberculosis Day: Migrants at high risk.